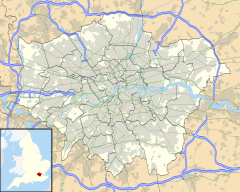 Muswell Hill is in the N10 postcode district and mostly in the Hornsey and Wood Green constituency. Muswell Hill, as defined by its postcode district, had a population of 27,992 in 2011. The earliest records of Muswell Hill date from the 12th century. The Bishop of London, who was the Lord of the Manor of Haringey, owned the area and granted 65 acres (26 ha), located to the east of Colney Hatch Lane, to a newly formed order of nuns. The nuns built a chapel on the site and called it Our Lady of Muswell. In the 18th century Muswell Hill was a scattered village consisting mainly of detached villas with large gardens. In 1787 one commentator wrote that nowhere within 100 miles (160 km) of London was there a village so pleasant or with such varied views. Little had changed by the middle of the 19th century. One of the houses of the time was The Limes. This house occupied the angle of Muswell Hill Road with Colney Hatch Lane and was a three-storeyed house with portico and two-storeyed wing approached by a double carriage drive through impressive gateways. The large grounds of the house extended to Tetherdown and included a lake. Opposite The Limes was Muswell Hill pond and beyond that the Green Man inn, built of stone. Further down the hill past the Green Man was The Elms, a squat three-storeyed house later improved by Thomas Cubitt standing in 11 acres (4.5 ha), part of the grounds of which were laid out by Joseph Paxton. A short distance down the north side of Muswell Hill was The Grove, which was three storeys high and had nine bays with pedimented projections at each end. It stood in 8 acres (3.2 ha) of grounds which contained a 200-yard avenue of oaks. In 1774 the house was occupied by Topham Beauclerk. A little farther down the hill stood Grove Lodge, also in wooded grounds. Altogether there were eight properties in Muswell Hill worthy of note in 1817. Parallel with Muswell Hill was a track known as St James's Lane which ran across a triangle of wasteland. By the middle of the 19th century houses were already dispersed along the lane at the foot of which was Lalla Rookh, a two-storeyed villa with a wide verandah. Other buildings there were apparently cottages or huts, both single and in terraces. It was not until the end of the 19th century that Muswell Hill began to be developed more densely from a collection of country houses to the London village that it is today. The development was spurred by the opening in 1873 of Alexandra Palace, a massive pleasure pavilion built on the most easterly of north London's gravel hills and intended as the counterpart to the Crystal Palace on Sydenham Hill in south London. Alexandra Palace was served by a branchline railway from Highgate, with an intermediary station at Muswell Hill (see below). The foot of Alexandra Palace was served by another rail network with connecting services to Finsbury Park and Kings Cross stations. Most development was initiated in the early 20th century when the current street pattern was set out and elegant Edwardian retail parades were constructed. The shopping centre is based on roads that form three sides of a square: Fortis Green Road, Muswell Hill Broadway and the extension of the Broadway into Colney Hatch Lane. At each node point is a church: United Reformed, Church of England, Methodist, and Roman Catholic. One of the nodes, opposite St James's CoE, was also the site of the Athenaeum music hall (later demolished with the site redeveloped as a supermarket), opposite which a surviving art deco Odeon cinema was built in the 1930s. The site of the Ritz, a cinema formerly at the top of Muswell Hill on the next node to the east, has been redeveloped as offices. Until the mid-20th century there was a rail branch line, the Muswell Hill Railway, from Highgate which passed through Muswell Hill, terminating at a station at Alexandra Palace. It was intended under the Northern Heights plan to integrate this into the London Underground Northern line; some contemporary tube maps (e.g. the 1948 map) showed the line as being under construction. However, this plan was cancelled after the Second World War, and the railway line was abandoned in 1954. The line was later converted to become the Parkland Walk. Until the reorganisation of London's local government in 1965, Muswell Hill formed part of the Borough of Hornsey within the administrative county of Middlesex. The area subsequently became part of the London Borough of Haringey. The northern portion of Muswell Hill was part of the Friern Barnet Urban District, also in Middlesex, which subsequently became part of the London Borough of Barnet. In 1964, three young Muswell Hill residents, the brothers Ray and Dave Davies and Pete Quaiffe, formed The Kinks. Categorised in the United States as a British Invasion band, the Kinks are recognised as one of the most important and influential rock groups of the era. The Davies' parents' home at 6 Denmark Terrace, Fortis Green, remains a magnet for rock music tourists. In 1979 Wetherspoons opened their very first pub, on Colney Hatch Lane. In March 2013 Muswell Hill was named one of the five most desirable places to live in London in the Sunday Times "Best Places To Live" guide. 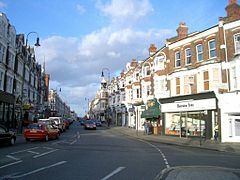 Close to Alexandra Park and Highgate Woods, Muswell Hill is a mainly Edwardian north London suburb. Muswell Hill Broadway and Fortis Green Road, the main shopping streets, still maintain their historic character with most of the original facades preserved above street level. The area has a synagogue and six churches, one of which has been converted into a steak house. Blanche Nevile School. A school for deaf and hearing impaired children, based on the sites of Highgate Primary School and Fortismere School. TreeHouse School, based at the Pears National Centre For Autism Education. Muswell Hill is not directly served by a tube station but several bus routes connect to the West End and the City. They also serve nearby underground stations at Highgate, Bounds Green, East Finchley, Finsbury Park and Turnpike Lane and to train services at Alexandra Palace and Hornsey. The 2011 census showed that 84% of the population was white (65% British, 16% Other, 3% Irish). 40% were irreligious and Christian each. In the war romance film The Americanization of Emily (1964), Emily's mother lives in a house in Dukes Avenue. Exterior shots show Alexandra Palace in the background. In the 1970s BBC TV comedy series Porridge, the principal character, Norman Stanley Fletcher, played by Ronnie Barker, hailed from Muswell Hill. Fletcher claimed that in his younger days he was "King of the Teds in Muswell Hill". Rock band the Kinks in 1971 recorded the LP Muswell Hillbillies, which included the song "Muswell Hillbilly". Southern Culture on the Skids has covered this song. The Yorkshire Television sitcom That's My Boy (1981–1986), starring Mollie Sugden and Christopher Blake, made frequent references to Muswell Hill, as the family lived in the area throughout the first four seasons. Series one of the 1993 sitcom Sean's Show is set in Muswell Hill. The Doctor Who episode "The Idiot's Lantern" (2006) was based around Muswell Hill, set during Queen Elizabeth II's coronation in 1953. Ska band Madness sung the lyric "I've been far, I drive up to Muswell Hill" in Driving in my car. See People from Muswell Hill and People from Fortis Green categories. Scottish serial killer and necrophile Dennis Nilsen committed his later murders in his Cranley Gardens flat in Muswell Hill and became known as the "Muswell Hill Murderer". John Logie Baird was the first person to transmit moving pictures, now called television. The first public broadcasts were from nearby Alexandra Palace before WW2. His scanning, rotating disc system was later replaced by a more modern electronic system. The John Baird pub in Fortis Green Road is named after him. The group Fairport Convention started in the Muswell Hill family home of Simon Nicol. The house, Fairport, is on the south side of Fortis Green near the junction with Tetherdown and Fortis Green Road. Musician, author, poet, wit and great English eccentric Vivian Stanshall lived his final years in Muswell Hill, dying in a fire in his Hillfield Park flat in 1995. Former KGB agent Alexander Litvinenko lived in Muswell Hill from his exile in 2000 until his death in 2006. A resident for a short time in Muswell Hill was the Russian-born England Rugby union star Prince Alexander Obolensky, who died in Suffolk in an aircraft accident in 1940 while training as an RAF Pilot Officer. Wikimedia Commons has media related to Muswell Hill. ^ "[ARCHIVED CONTENT] UK Government Web Archive – The National Archives". Ons.gov.uk. Retrieved 7 September 2016. ^ Muswell Hill Manor in Oxfordshire was said to be owned by the King of Scotland in the 12th century. ^ The earliest known description of the river is given by the Tottenham Historian Rev William Bedwell (1561 - 1632) who used these two variants in 1631 in Willhelm Bedwell, A Briefe Description of the Town of Tottenham Highcrosse in Middlesex, 1631. ^ J. Keane, Beauties of Mdx. (1850), 148-9; Hornsey libr., N. Mdx. Photo. Soc. no. 632. ^ Postcard in Hornsey libr. ^ B.L. Maps Dept., sales parts. (1880). ^ C. Nicholson, Scraps of Hist. of a Nethern. Suburb of Lond. (1879), 16; sales parts. (1939) in Hornsey libr. ^ Hassell, Rides and Walks, i. 194. ^ "South Friern (Finchley N10)". barnet.gov.uk. Retrieved 7 September 2016. ^ "Refurb for Tim Martin's first outlet". Property News. Morning Advertiser. Retrieved 26 February 2010. ^ Good Stuff IT Services. "Muswell Hill - UK Census Data 2011". Ukcensusdata.com. Retrieved 7 September 2016. ^ "Sean's Show". Channel 4. Retrieved 9 August 2013. ^ "Driving In My Car". Retrieved 19 March 2018.